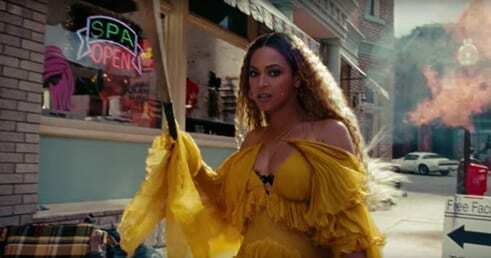 Beyoncé’s Lemonade (2016) – both the record and the extended video – is a new version of what, by now, has made her a household name that transcends pop stardom: appropriating and repurposing icons and ideas from other artists and art forms from all walks of life, to quite literally turn them into gold. From the fan-captured videos of her hanging out with Jay-Z at Grizzly Bear or Beach House concerts in conscious search for inspiration, to the not-at-all-subtle nod to the stunning work of Anne Teresa de Keersmaeker in the pretty extraordinary video for the great “Countdown” (which was also full of less flagrant “shoutouts” to Jerry Lewis or the work in music videos by the Barcelona/London based collective Canada, and the list could keep going), she has blossomed into a floating leviathan, equal parts grace and gluttony. But what does “getting back” mean when it comes to a corporation of mainstream culture? On the one hand, Beyoncé’s gesture lands like a belated moment of justice – a strong black woman taking over the spotlight and feeding off everything that’s been once taken from her peers in both present and past (the whole trajectory of “Formation”, from New Orleans to the Superbowl, being a great example of its effectiveness), generating what is now impressively close to a critical and popular consensus – while, on the other, the cannibalization of whatever today’s model of (albeit tamed) counterculture is by such a giant player in the mainstream brings back the normative bittersweet aftertaste of classic Hollywood and the strange practice of North American remakes. Lemonade is the new, shinier, grander chapter in this ballet of debris: from the long payroll of collaborators and special guests to the occasional references to the music of indie acts such as Vampire Weekend, James Blake and the Dirty Projectors (whose own appropriation of r&b is now being brought back to the Knowles clan), Beyoncé and her team have mastered the craft of sanding and polishing disparate pieces until they fit together. The record and the video (being marketed as a visual album – something TV on the Radio did a few years ago, with less success in every possible term) are both far from seamless, but that irregularity is part of their nature: Beyoncé’s unrestrained shiny mess is as much her force as it is her weakness. All of that fits our age like a glove: at a time when cultural journalism seems to have lost any sense of pedagogy and critical thought, and chose to reduce itself to namecheckers and publicists of the current zeitgeist (David Bazan on music reviewers: “So if it starts to get you down/ just pretend / That you don’t make your living / From selling advertising”), Lemonade is a battlefield being embraced as if it were a playground. In its Shrek-like (or Family Guy-like; or…) willfulness to patchwork the scope of mass culture, yet quietly change it from within by incorporating discoveries picked up at the margins of the industry, both the record and the video are full of contradictions and interesting problems that have been systematically ignored by press and critics alike – sensational accusations of plagiarism and bovine numbering of references aside. That dilemma is condensed in the video for “Hold Up”, a song that ironically enough quotes her own “Countdown”, in clever mise en abyme, put alongside the Yeah Yeah Yeahs’ “Maps” by main songwriters Diplo and Ezra Koenig (Vampire Weekend) and other interesting samples. It’s a horizontal song, interweaving different sensibilities in one constant flow that both serves and is served by the singer. While the inspiration taken from Pipilloti Rist’s videoart/feminist classic Ever is Over All (1997) is stated here and there on specialized vehicles, frequently seasoned with the forbidden flavor of a “hidden secret” (to denounce or revel in), a thorough search didn’t lead me to a single article that would address the elephant in the room: what does she (the corporation) do with it? Avoiding the trap of comparing bank accounts or giving into my own box-checking routine, Ever is Over All – which is now on view in New York at the New Museum, in an extremely popular retrospective of the swiss videoartist – is more modest in production scale but grander in means: the video is presented as a dual-screen installation, one of which shows a field of flowers, and the other shows the artist herself captured in slow motion by two cameras, walking down a street, using that same flower to smash the windows of the cars parked by the curb. It’s a work rich in ambiguities: the phallic shape of the flower contrasts with the flow of Rist’s colorful dress; its fragility is subsumed by its use to shatter the car windows, contrasting with Rist’s joyful, guilt-free slow motion walk; the apparently improvised nature of the video – the dated video texture; the jittery handheld camera work – is suddenly shaken by the appearance of a policewoman who, instead of censoring the artist, salutes her rebellion, adding a layer of fiction that contrasts with the spontaneous (?) awe of other passers-by. The political defiance of the apparent documentation of the public performance acquires the grandeur of a blockbuster, as cars are treated as mere props in a larger than life solitary flash mob. The shots are mostly medium wide, rendering Rist as ordinary: it is not her who is exceptional, but what the flower can do. The juxtaposition of the two screens alone creates all sorts of dialectics, expanding the dichotomy of gender and normative stereotypes – female fragility, for sure, but also the mix-gender symbol of the phallic flower and all the combinations that come from the contrast of specific moments between those spheres – at the same time that it questions the very nature of the work: is this a street performance or a staged scene? The power of Rist’s piece comes from the coexistence of all these questions, which the work can only leave unanswered. The viewer is forced to question their own ability to accept; the political power of the work comes precisely from its centrifugal nature. In the video for “Hold Up” – directed by Jonas Åkerlund – the changes made in translation from the gallery to HBO point at a substantial undermining of the contradictory potency of Rist’s landmark work. The most obvious one is the substitution of the flower for a baseball bat – perhaps a nod to Penny Marshall’s A League of their Own (1992), but at the expense of all the ambiguities of Rist’s iron flower, which combined male and female symbolism as a weapon in the hands of a woman, who used it against society, gender expectations, materialism, capitalism, etc. Another important change is in the body language present in both works: Rist’s gleeful walk – a striking source of contrast with her destructive impulse which advocates for a non-exclusive, and consequentiality non-normative, sensibility – is substituted by Beyoncé’s usual fierceness – a strong asset in itself but, in this case, a redundant one. But the most substantial change is one of mise en scène: by cleansing the work of its improvised appearance, showering it with production value, Åkerlund/Beyoncè flip Ever is Over All on its head. The ambiguity of register in Rist’s work is out of the picture: Beyoncé enters the world of the video sashaying down the steps that allow Gods to walk among humans, controlling water and fire. It’s a strong image whose political meanings are as obvious as they are fair. This is no longer an ordinary street with (what look like and only look like) spontaneous passers-by and subverted figures of authority, but a studio environment: a street where traffic is controlled, explosions can happen to the beat of the song and we know how to look/who to look at from the very beginning. The destabilizing reactions one could spot at the fringes of Rist’s video – reactions of casual amazement that reflected the gallerygoer’s own suspension – are now marked by spaghetti western-like reaction shots (minus the baroque irony), which underscore Beyoncé as a centripetal presence, to which all attention must be channeled, and who goes out with a literal bang. But Åkerlund/Beyoncé don’t treat Ever is Over All as “hollowed out signs in the form of allegory, the ruin of language”, but as living signs to be repurposed, made more palatable and more normative, bent to the superhero logic that has turned pop art into pop culture: a regime of cultural exception. The problem is not in the gesture of appropriation itself, but in taking the original work and repurposing it as a narrower version of itself, if not a completely opposite one. After all, “when you call up a spectre, it will not content itself with being inspected, it will require active negotiations to accommodate the ghost and direct its actions or at least keep them in check.” (Verwoert). And, if betrayed, it might also come back to haunt you in your sleep. In Rist’s work, the power of transformation was in the affirmation of the conceptual underdog: a flower can smash a window, a phallic symbol can be claimed as a feminine weapon, a normative gaze can be turned against itself… every street can become a battlefield because it already is one. Every cell is a potential revolution. While “Hold Up”, the song, is horizontal, the video is vertical: there’s not only a clear center, but also one that cannot be reproduced. Ever is Over All is a political work precisely because it is exemplary, while the music video is merely exceptional: there are things that can only take place in a studio, with timed reaction shots and explosions synced to the heartbeat of the 808. There are windows that can only be smashed with a baseball bat, by an entity coming from above. There are things only a superhero such as Beyoncé is allowed to do, and the rest of us can do nothing but watch, bedazzled by the spectacle of destruction. A flower is, once and again, simply a flower.